The first clip from City of Ember dropped over at scifiwire today and I wanted to post it as the more I follow the film, the more I'm interested in seeing it. In the clip, the legendary Martin Landau teaches Harry Treadaway the importance of keeping your mouth shut when things don't seem to be going right in the doomed City of Ember. It seems "so far so good" is the running motto for the population who have been taught to look the other way when all is not well. Sound like a job for a couple of spunky tweens! Anyway, you can check it out after the break. The film's awesome trailer is here. City of Ember opens on October 10th. 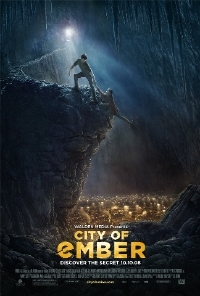 City of Ember: So Far So Good from City of Ember on Vimeo.